Drink UP&GO™ for the right type of energy! 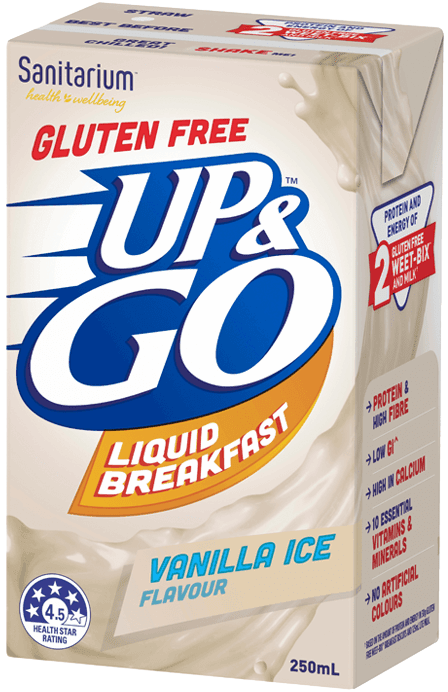 UP&GO™ Gluten Free looks and tastes similar to regular UP&GO™. With gluten-free ingredients, a low GI^, protein and fibre, you'll have the right type of energy to make the most of every moment that comes your way. Filtered water, skim milk powder, cane sugar, corn maltodextrin, soy protein, vegetable fibre, vegetable oils (sunflower, canola), fructose, mineral (calcium), acidity regulatory (332), flavours, vegetable gums (460, 466, 407), stabiliser (452), salt, vitamins (C, niacin, A, B12, B6, B2, B1, folate).